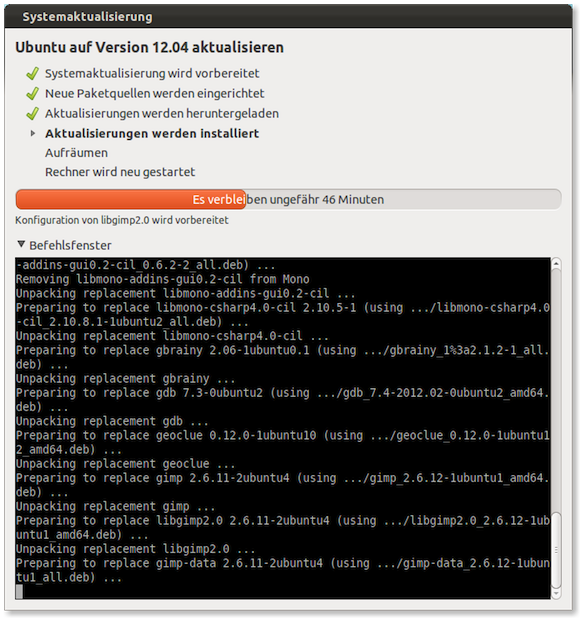 First, make sure you have all the latest software updates installed on your current 11.10 version of Ubuntu. 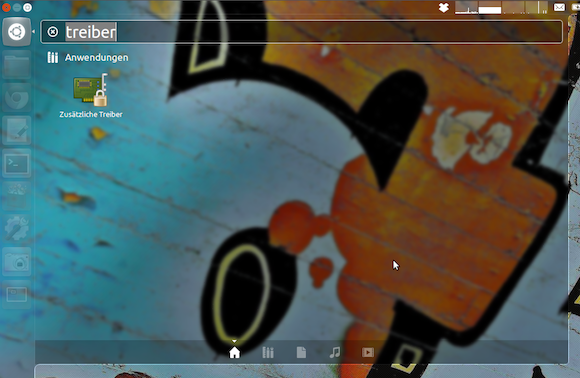 Just open the Update Manager / Aktualisierungsverwaltung (first icon), check for updates and install them. Click on the screenshots for bigger images. NOTE: For those of you, who don’t have a desktop environment installed, the upgrade can be issued from the command line. 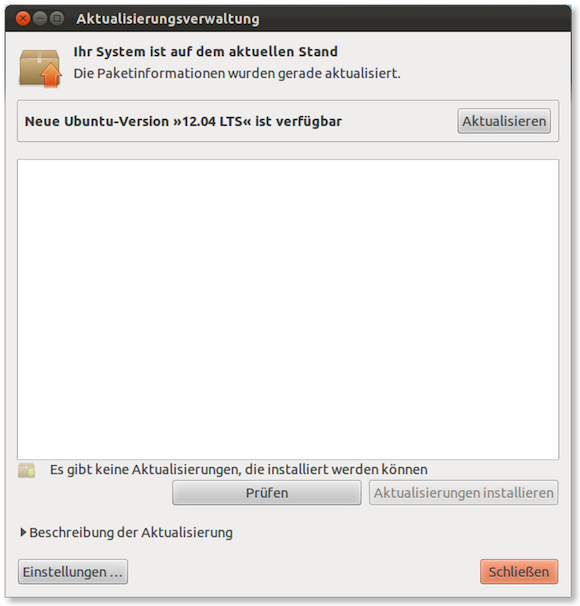 As you see on the top, there is notification that a new version of Ubuntu has been released. Klick the button saying Update / Aktualisieren to start the process. You will be shown some information about the software update. 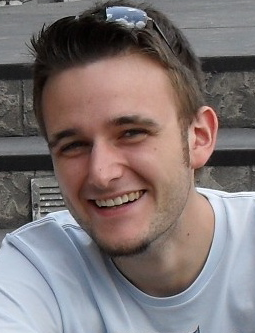 Let’s go for it by hitting update system / System aktualisieren. After the updated packages have been downloaded, the upgrade itself begins. On my Core2Duo Laptop, it will take some time…. This process will be MUCH faster on a SSD drive than on an ordinary hard drive. After the upgrade, old packages are being remove from your hard drive to save some space. As far as I can tell from testing out the new version of Ubuntu, the Precise Pangolin is running very smooth as you would expect from a long term release. If you got one of those most recent laptops with integrated graphics into the cpu, this version will even give you more battery life due to improved drivers for Intel integrated graphics. 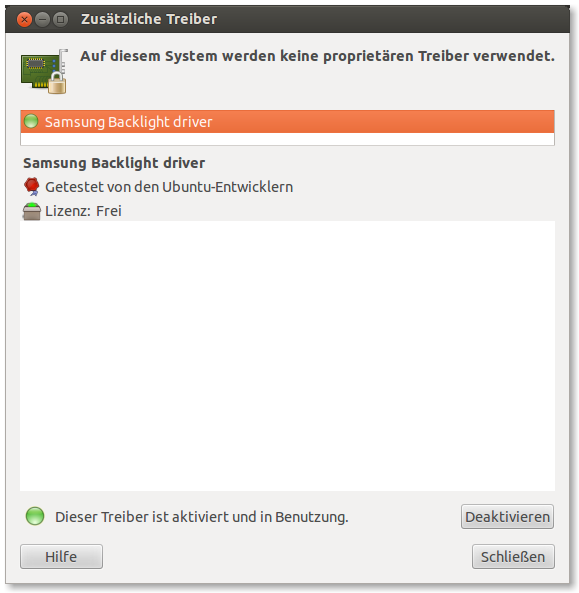 One more thing: After the first reboot, you should check if you can update or install proprietary drivers / Zusätzliche Treiber to get optimal performance from your system. Just open the tool and see if for your ATI or NVIDIA graphics card you have got the most recent drivers installed. My laptop, only needs a proprietary backlight driver that let me use the brightness keys. 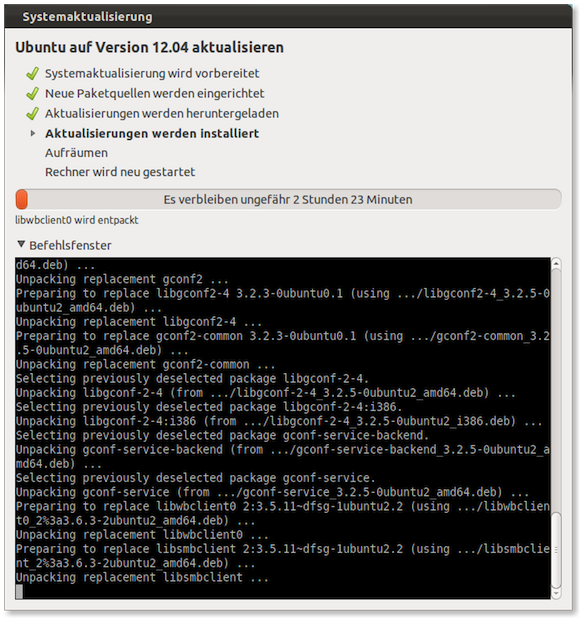 Now, have fun with your freshly upgraded Ubuntu 12.04 installation :) Let me know what you think of my upgrade manual and of course of Ubuntu 12.04 in the comments section. Thanks to Jawodo: If you press and hold your „windows-key“ on your keyboard you will be shown the most frequently used key shortcuts in unity. I pretty much prefer Gnome-Shell since it was shipped with 11.10 and will stay with it. 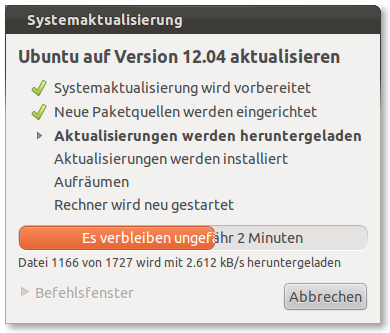 I suppose Gnome shell is available in 12.04 as well, isn’t it? You just postet a way to ruin a good working system. 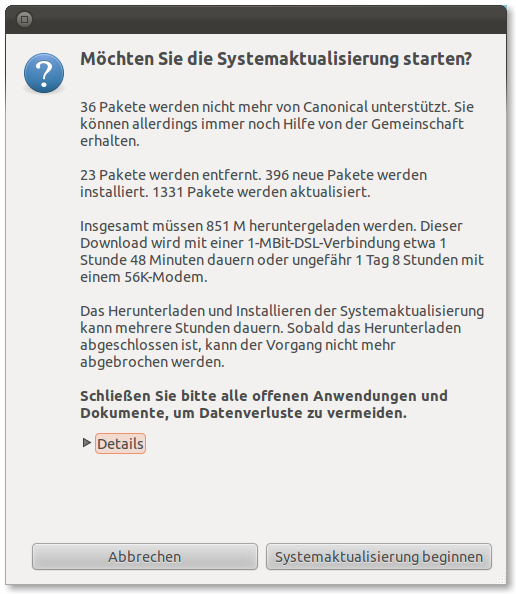 You forget to tell how to install a usable Desktop Environment like Gnome 2 oder something else. i also miss a WARNING that the user experience could be extremely shocking if the user has not informed himself about unity before. i had this shock on the normal version, after an update like described here my useful and good working Gnome 2 Desktop was replaced by odd looking crap called Unity. 1. The Taskbar at the bottom of the screen is gone. No way to see what programs are running with one single view anymore. 2. 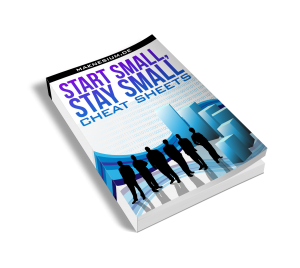 The nice Menu is no longer used to start programs and you will get no start menu either. 3. there is an ugly looking thing on the left side of the screen which you cannot remove there. somehow it shal replace all the nice things you liked to use before. Well, what desktop environment you choose depends or your taste…. I like Gnome and I was keen enough to give Unity a try. After some time, I really like the simplicity :) But the good thing is, as we are Linux users, you can just choose whatever desktop environment you like. 1. Just look at those little „arrows“ in the Unity launchbar to determine which programs are currently running. Just like in Mac OS X. 3. You can remove the launcher of course. Then, it will only appear if you move your cursor to the left edge of the screen. You can change this behaviour under „System preferences > Appearance“ if you like. thanks for this feature! It helped me a lot.